Heel pain is a very common problem presenting as pain in the morning, pain on rising, often acheing in the afternoon and in long standing cases most of the day. The plantar fascia is like a thick elastic band that runs from the heel to the toes and is heavily affected by foot function, footwear, foot strength and body posture. Footwear is often the cause, and therefore an integral part of the treatment. Conservative care including massage, stretching, strengthening and iceing help, however this is not limited to the fascia itself as it is heavily influenced by many of the surrounding structures. Taping and arch supports are often beneficial in the acute cases. 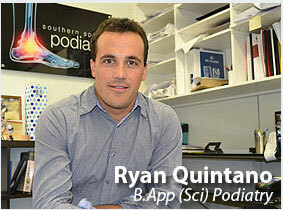 Orthotics are usually used by the treating podiatrist if symptoms do not quickly settle. Its is important to look at work footwear, body posture and gait analysis when treating plantar fasciitis. Heel pain can be treated at Southern Sports Podiatry, right here in the centre of Sutherland.